An awful pun, but yet again, as reported in yesterday’s Sunday Times, a small start-up finds itself in a David & Goliath trademark battle with a large and well known brand. 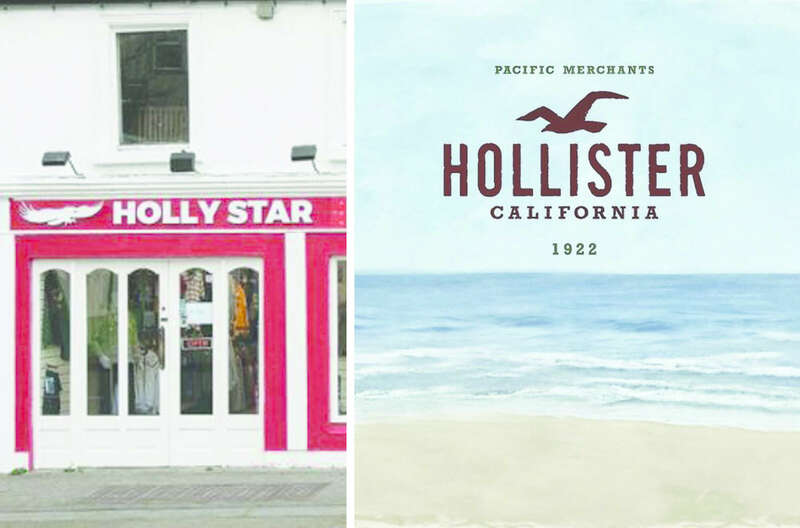 In this case, a small clothes shop in Mayo called Holly Star, finds itself in the High Court, having allegedly breached the copyright of the Abercrombie & Fitch Hollister brand. In February 2016, Holly Star, which was incorporated in December 2015, filed an application with the Irish patent office to register a trademark for its logo and name. The Hollister brand famously includes the silhouette of a seagull, while Holly Star appears to include an eagle. The owner of Holly Star reported that he paid €800 to a designer in Ballina to develop the name and brand. On a human level, we all naturally tend to root for the little guy and there is an argument to be made that as a small shop in Claremorris, Holly Star represents no competitive threat to the might of A&F. However, I believe the mistake Holly Star made is in trying to register a name and logo as a commercial trademark when arguably, it is very similar to Hollister. Had they not looked to register as a trademark, there is every chance I suspect that they would have remained below the radar and would have possibly been allowed to trade away. Looking to register, I believe, was something A&F and their lawyers could not ignore as to do so could potentially set a bad precedent, weakening and undermining their valuable trademark. Next up could be someone looking to register Hollista or Hollyster and of course there is always the chance that Holly Star could grow to be a much bigger entity. Whether Holly Star and their designer intentionally and knowingly looked to mimic Hollister or not, surely the wisest and most commercially sensible thing to have done, would have been to create a more unique name and symbol, especially if their intention all along was to look to create a valuable trademark? Or perhaps they felt it was significantly different enough to actually warrant the granting of a trademark, thinking that because they were small, they would be grand. Sure why would A&F be bothered with a little clothes shop in Mayo? Having invested as much into the Hollister brand and trademark as A&F have, I would imagine they are very interested in anyone, no matter how small, trying to wangle some of their pie. The trading and registering of brand names and marks is a serious business and the investment in creating a well-considered, researched and designed identity would pale into comparison to the cost of defending an action in the High Court, the disruption to business (the Garda have reportedly seized their clothing stock) and the potentially lost opportunity to scale and grow. This is an all too common problem which we regularly see, where companies and brand creators do not pay significant attention to the importance of their name, storing up problems for themselves further down the line. Telling your own unique brand story, which gives the customer a sense of what you stand for and what is distinctive about you, will not only resonate far more but can potentially become a valuable asset that you can look to protect. Brand names developed by CI Studio include Marqette (Dublin Airport’s food market), Havok (gaming giant owned by Microsoft), Tusla (Ireland’s Child & Family Agency), Saba (Dublin’s Thai & Vietnamese restaurant), Bo Bristle (Irish craft beer) and many others.